♫ SUPERIOR SOUND QUALITY: Experience your music in full-bodied stereo realized through dual high-performance drivers and dual unique enhanced bass. Less than 1% total harmonic distortion ensures enhanced clarity and fidelity.5W x2 RMS Output Power. ♫ FM RADIO Auto Smart Search Function(87.5-108 MHz): Keep press \"Mode\" in Radio Mode, it will search channels automatically and Record the channels, then press \">ll\"to choose the channel you want. ♫ HANDS-FREE CALLING AS A SPEAKERPHONE. Tired of your shoulder and neck pain due to the phone call? Enjoy the speaker as a loud speakerphone to free your hands when calling with built-in mic. 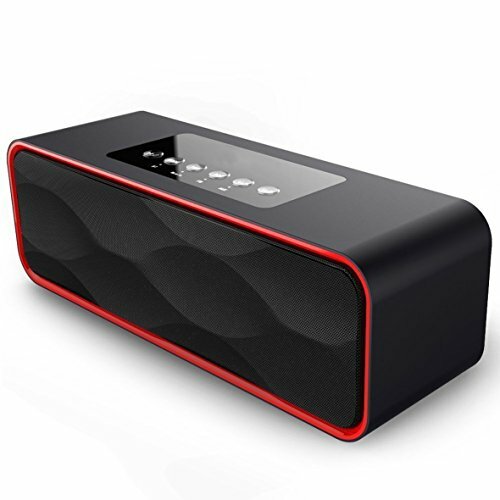 ♫ QUICK & EASY PAIR WITH 8 HOUR PLAY POWERFUL WIRELESS SPEAKER: Ultra-compact Bluetooth speaker that can easily be slipped into your backpack or bag. Super easy to pair, just search and pair. Want your tunes with you anywhere? With the power dual 5W audio driver and high quality clear sound, this is the right one to get. ♫ WHAT YOU GET: XPLUS Portable Wireless FM Radio Bocinas Bluetooth Speaker x 1, USB Charge Cable x 1, Aux 3.5mm Audio Cable x 1. We provide 30-day money back guarantee, 24h friendly customer service and email support everyday.